I have an old copy of 'Cross and Cockade Journal' (Summer, 1976, vol17no2). This has an article titled 'The Indian Flying Corps and the Australian Half-Flight', by Dr. Brian P. Flanagan. The article is based on service reminisces and photographs of a Mr. A. E. Shoreland, a sergeant in the Australian unit, and the log-book of Air Commodore W. H. Dunn (then an R.N.A.S. sub-lieutenant 'up the Tigris'). The article gives a good summary account of the air activities during Gen. Townsend's ill-fated campaign, and covers more than the title indicates. A good portion of the account, and of the photographs, relate to an R.N.A.S. detachment, commanded by Squadron Commander Robert Gordon, assigned to support the flotilla of river gunboats the Royal Navy was operating on the Tigris. The initial equipment was three Short 827 float-planes; the unit was detached from RNAS forces assigned to East Africa after the destruction of the Konigsberg. Two of the 827s had their floats removed and replaced with wheels for operation from land. The unit received two Voisins in January, 1916, and in February received two HF.27 'Steel Farmans'. With this equipment, attenuated by some mishap, the naval pilots assisted in the attempt to supply Kut from the air during the seige. I woulds like to learn anything more that I can about this R.N.A.S. unit, and its equipment. I would like to do a model of one of the 'converted' Short 827 machines, or of one of the 'Steel Farmans". Photographs in the article show all the naval machines with prominent Union Jacks on the vertical tail surfaces, and seem to show the Short and Voisin types to also be marked with the old red ring of the R.N.A.S. on the wings, usually associated with the jack on the tail. Though information on Short 827 seems to be pretty thin in general, there are some good pictures in this article of one of the 'converted' machines that draw me strongly as a modeler. Interests:WW1 Naval Aviation, with special interest in Seaplane Carrier operations 1914-1919, especially in operations of the East Indies and Egypt Seaplane Squadron. 3900 and 3901 shipped to RFC Force D in Mesopotamia mid 1916. A Brief history: The Short 166 was slightly larger than the Short 135 but retained the 200 hp Canton-Unné engine, an improved design the Short 827/830 followed. The Short 827 having a V8 Sunbeam 155 hp engine, the Short 830 a 135 hp Salmson radial engine. Finally, the Short 184, with 225 hp V12 Sunbeam engine, was being developed and would become the most widely used British floatplane of the war. So, you could consider the 827 was a fill in before full production of the more capable 184 commenced. Nevertheless, some 108 were built and it saw extensive service, but mainly over the N Sea/English Channel. It also served in Mesopotamia, E Africa and Belgian Congo. Only three appear to have been shipped RFC Force D: 822, 825, 827 (all from the first production batch of 6 aircraft). The only known RNAS pilots are Flt S/Lt W H Dunn, and Major Robert Gordon, RMLI. There does not appear to have been an RNAS unit as such... And, I can find little, well nothing, about RFC Force D either. There were so few aircraft available during the early part of the campaign that I believe it probable that they were 'pooled' under RFC command - see In The Clouds Above Baghdad by Lt Col John E Tennant, an essential account of the air war by the RFC commander. If anyone else knows of an RNAS unit, please let us know. British air support had been pathetically inadequate since the start of the campaign, 30 Squadron RFC having few aircraft and these were unsuitable for the hot, dusty conditions. In June 1915 three Short Type 827 seaplanes (Ser. 822, 825 and 827) were sent from UK via Gibraltar and arrived in Basra on 5 September. Under the command of Squadron Commander (Major RMLI) Robert Gordon RNAS, who had been transferred with RNAS air and ground crew from East Africa, the seaplanes were intended to be used for co-operation with the Naval forces in Mesopotamia but forward reconnaissance and communications duties in support of the advancing (and later retreating) British forces were vital. The Type 827 seaplanes also proved under-powered in the conditions and they were converted to wheeled undercarriages for land operations which increased their utility. As Kut fell under siege the RNAS Seaplanes withdrew to Basra on 4 December. On 17 January 1916 the RNAS squadron was reinforced by the arrival, in SS CHANTARA, of two Voisin III biplanes (Ser. 8505 and 8506) and the RNAS and RFC aircraft and pilots operated interchangeably from then on as a composite unit, supporting the Army ‘Tigris Corps’ attempting to relieve the besieged and soon starving garrison at Kut . In February more aircraft, transported in SS HUNTS CASTLE, arrived for the RNAS in the shape of two more Voisin IIIs (Ser. V.1540 and V.1541), two Henri Farman F.27 (Ser. 3900 and 3901) and five Short 184 seaplanes (Ser. 8043 to 8047) with more powerful engines. On 6 March the composite RNAS/RFC force was formally constituted as one formation under army orders with Wing Commander Robert Gordon RNAS as ‘Air Commander Tigris Column’. His ‘air force’ was formed of 30 Squadron RFC and the RNAS Squadron under Squadron Commander Frederick W Bowhill RNAS, who had brought the five Short 184s out from England. The months of March and April 1916 were taken up with support of the Kut relief column and with support of the increasingly desperate Kut garrison. The Turkish forces had now been reinforced by a German air squadron which included Fokker single-seat fighters. Air operations came to a climax between 15 and 29 April when they vainly attempted to keep the British troops besieged in Kut-al-Amara supplied by air-dropping food and supplies. Despite their limited ability to lift heavy loads in high temperatures about nine tons of food were dropped into Kut on 140 sorties. Despite opposition from German fighters, the cargo aircraft had to fly with only one pilot armed with a revolver for defence. All armament had to be left behind to maximise the stores lift. One Short was lost in air combat (Ser.8044). The 12,000-strong British garrison of Kut surrendered to the Turks on 29 April 1916. The RNAS withdrew from Mesopotamia in June 1916: its Short seaplanes were taken to Port Said and the crews were re-appointed to East Africa and elsewhere. The two remaining Voisin III biplanes were handed over to the RFC. I know of only two other RNAS aircrew: Flight Lieutenant Cecil Bell GASSON (injured in the loss of Short 8044) and Flight Lieutenant Wilfred Henry DUNN - later Wing Commander DSC). My understanding is that "Force D" was the name of the British Indian Expeditionary Force, of which the RNAS/RFC squadron formed a part, not of the squadron itself. Thank you Horatio2. That is great information. I love a day that starts out learning something old that is new. There is an image (attached) of 822 on wheels in the Australian War Memorial, A04135. Thank you very much, Gentlemen. I am going to bite the bullet and scan the article next week, and (if it does not violate any rules) put the pages or photographs up here. If that proves not proper or possible, I will present a better account of information contained. I've just been through the index for the UK Cross and Cockade / Cross and Cockade International and then the light went on! You are talking about the old US Journals, now named Over The Front. As the original Cross and Cockade Journals have been republished and are for sale (http://www.overthefront.com/shop/league-membership/164)I cannot recommend publishing a scan on this forum. However, a paraphrasing should do no harm. Hmm. The website was garbled. I'll try again. I have sent off an inquiry to the Admins, Sir, but with what you say, I expect their reply will be negative. I will prepare a digest, and perhaps a handful of the more interesting pictures would not be taken amiss. The picture of 822 you posted up comes from the photo collection featured in the article, and there are two more which show 822, and one which shows a Martinsyde Scout (disassembled, fuselage only) with both its R.F.C. serial and its Indian Flying Corps number on the rudder. Finally got the scanner engaged, Gentlemen. Summary of the article will follow, but here are five of the many pictures it contains. Interests:European history; Irish aviation history; Great War flying services. Cato's "Navy Everywhere" is a nice contrast, e.g. for accounts of the Manica etc, and one can probably use that book as a gauge as to the accuracy or otherwise of what's written in the Mespot book, i.e. to keep the story flowing there's a tendency to trim certain detail or to compound certain tales. Royal Naval Air Service: Operations in German East Africa 1914-1918, Vol 37, N3 and 4 (2006) and Vol 38 N1 (2007). I recommend anyone with an interest, or opinion, consults these articles. Here is a bit of summary from the article referred to in the OP, with some additional bits here and there. According to the same source, 822 crashed on '14 December, 1916' after which it was struck off charge. I suspect either a typo or a conflation here. 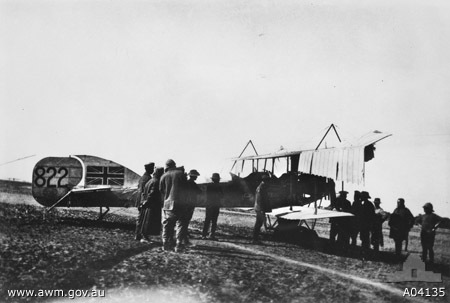 According to Lt. Dunn, in the C&C article, 822 turned turtle in a landing on 14 February, 1916, at Omrah, and was not repaired, as new aeroplanes arrived shortly afterwards. December of 1916 is simply not possible: if 1916 was typed instead of 1915, there could have been two prangings, and the 14th being the date of both mere coincidence. the widely circulated photograph of 822 seen above, taken at Ma'Gil field at Basra, does show a damaged aircraft, with its wheels bent and some crumpling of the upper starboard wingtip. The C&C article refers to two flights from Basra to Orah. In the first, on January 30, 1916, two newly arrived Voisins and two 'converted' Shorts, flew from Basra to Orah, with one short and one Voisin being rendered unserviceable en route. The second flight given is as taking place from '12-14 February',this being the occasion when Lt. Dunn flew 822 from Basra to Orah, and on landing at his final destination 'my wheels sank into a newly filled, muddy ditch and she turned over on her back.' The article then goes on to say 'the other converted Short got safely to Orah', raising the possibility that another Short accompanied Lt. Dunn and 822 in February. Since the C&C article states that only two of the Shorts had their floats swapped for wheels, this introduces a note of confusion, as two flights of tgwo works all right if there are three converted Shorts, but not if there were only two. The time lag seems about right for recovering and repairing machine come to grief in the first flight, so that if it is accurate that only two Shorts were 'converted'. 822 would have been the Short which failed to reach Orah in the January 30 flight. The C&C article suggests, without stating so directly, that the Shorts operated from Kut, and flew out in early December, 1915, just before the place was invested. "Chasing Fritz --- no catch." "To Fuzzy's aerodrome with six pills." "Spotting for guns. Snow at 5500 feet." "Could make no heading in wind." "Chased E.A., forced him to land." "Recce and photos. Dropped 1000 rupees in Kut." "50 lbs. chocolate, 100lbs. salt, 500 rupees." "Sketching in floods, weather too bad." The identity scheme began with numbers assigned sequentially on acquisition, with a prefix indicating manufacturer, thus 'MF 1' was the first Maurice Farman acquired. This was soon replaced by India Flying Corps numbers, running in sequence, regardless of type, with an IFC prefix. These were all supplemental to any R.F.C. serial already present on a machine. MF 7 IFC 7 Maurice Farman MF.11 Flew food drops to Kut-al-Amara. IFC 10 Maurice Farman MF.11 (From R.N.A.S. ?) Flew food drops at Kiut al-Amara. IFC 11 B.E. 2c RFC serial 4500. Escaoed from Kut al-Amara December 7, 1915. Flew food drops to Kut. IFC 12, 12A, 14 All three B.E. 2c; one lost at Ctesiphon, two abandoned in Kut. Finished the model of No. 822 on wheels, Gentlemen. I appreciate very much the information you provided, it was a big help in putting together the story behind the machine. In poking about, I found one other RNAS airman involved: Flt. Lt. Vivian Gaskell-Blackburn. My great grandfather, Lt Col R A Bradley, was involved in the action on the Tigris river in 1916, I have 2 albums of photos of his time in Mesopotamia where he ended up being OC at GHQ Baghdad of what is referred to as 31 group RFC/RAF . I have photos of the action at Kut , his own aircraft a brand new Be2c and what looks like a Farman on a barge besides his quarters on a steamer on the river, also in the album is a letter from GHQ informing him of his "substantive promotion" in 1918 which is headed with the title "Indian Expeditionary Force "D" "
I have started uploading some of these photos into an album in the members gallery , there are over 100 so it will take some time. If you would like to see them I am putting them in an album marked "Mesopotamia 1916-1919"
Nice photos, I'm looking forward to seeing more. Regarding "HMS Amarantine ? on the river Tigris at Baghdad in 1918". Well it is an Insect class gunboat - the two side-by-side funnels are a dead give away - and there was no "Amarantine" in the class. There were 12 built and Gnat, Mantis, Moth and Tarantula served with the Tigris Flotilla. Take your pick. I think it must be "Mantis" the caption was written in white and it has faded so it is unclear but mantis seems to be the nearest fit !! Glad I checked back in, Sir: I will certainly take a look. This is an old thread but with some good stuff on it so I thought I would add a bit more information about some of the RNAS groundcrew 1915. I was trying to determine whether PettyOfficer Henry Wise was under siege inside Kut el Amara ( which is what was implied by his little write-up in National Roll of the Great War). In so doing I came across a reference to airmechanics being transferred in mid 1915, including Henry Wise. So I thought I would try to compare his service record with some of these others. What is clear is that they all follow a similar adminstrative pattern and that in 1915 in Mesopotamia they came under the Senior Naval Officer's ship. Where they were physically is another matter. Here is a list of names that I looked at with results so far, showing ship changes in the period I'm interested in. Obviously there will have been subsequent additions but it seems reasonable to assume that these men are the initial ground crew when the 4 RNAS aircraft arrived in Mespot. The AMC Laconia had been operating on the east coast of Africa, incl the search for the Konigsberg. Elephanta was a transport that went to Basra. Henry Wise's record shows he was permanent crew (List 6) of Laconia rather than temporary (List 14) like the Air Mechanics. His record also states that he may not transfer to the RNAS but may work with them. The other men I've checked above all seem to be RNAS and in Apr 1914 became RAF. Their RAF service numbers can be deduced by dropping off the letter F and adding 20000 to the old number eg Gregory becomes 202675. I'm coming to the view that Wise was never inside Kut but working with the Relief Force and NatRoll used artistic licence but.. ? Edit: Here is a link to the thread that started me off on this. If it's any use, I have a Flight Lieutenant Blackburn RNAS in my notes (Kut September 1915) for some reason. And a saved page including several RFC officers taken prisoner at Kut. Thanks,It is the ORs that I really want to trace. Note VB Blackburn sould be Vivian Gaskill Blackburn as referred to in an earlier post. But I'm getting sidetracked, again. Thankee. Only have officers from Kut in the page from 'Flight' in question, presumably because they are better documented. Might be ORs if I had time to investate further.